The Bitcoin, an alternative cryptocurrency, has recently taken the world by storm. While the value of paper fiat currency falls around the world the Bitcoin has grown in popularity. It has gained worldwide media recognition and has recently reached prices of $130 for 1 BTC. The coin celebrates the spontaneous emergence of this alternative virtual medium of exchange by artistically marrying it to one of the oldest commodity currencies in written history: silver, thus giving it the almost tongue in cheek name: The ‘Bitcoin Coin’. 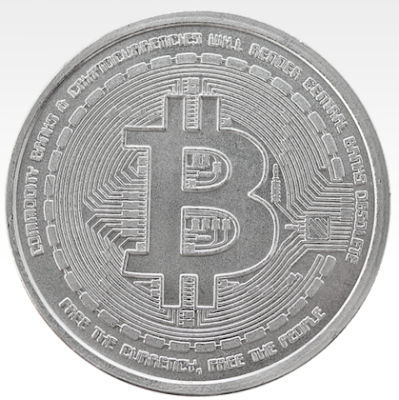 The coin’s message, printed boldly around the Bitcoin currency symbol sums up this iconic new and old relationship: “Commodity banks and cryptocurrencies will render central banks desolate- Free the currency, free the people”. The Bitcoin Coin features the iconic Bitcoin currency symbol on its obverse. It is set on a background of a computer circuit board and boldly states the message “Commodity banks and crypto currencies will render central banks desolate- Free the currency, free the people”. 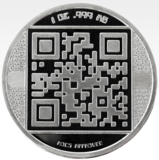 An operational QR code decorates the reverse, in dual finish: the foreground is satin, and the background is mirror-finish. When scanned by a smart phone the code directs you to the M2 Factory Store. Give it a try!